Looking for a college in Columbus, Ohio? Franklin has been a a major part of the central Ohio community since 1902. With career-focused programs and class schedules designed for busy working adults, taking courses at Franklin’s Columbus, Ohio, location offers a flexible and convenient path toward earning your degree. Scroll down to see which degree programs are available in Columbus. So when you’re ready, request free information about earning your degree from Franklin, or apply online for admission. Along the way, you’ll work with a helpful admissions advisor who can answer any questions about getting started at Franklin. Because we work in partnership and have a 3+1 program with Columbus State Community College, graduates seamlessly transfer their associate degree credits toward a bachelor’s degree at Franklin. Established in 1998, the Franklin University Community College Alliance (CCA) lets you maximize your education at one of our 230+ community college partners nationwide. Thanks to the CCA, you can complete your associate degree with the option to complete additional semester credit hours of preparation, or bridge coursework, at your local community college. Plus, all of your associate degree credits earned at a CCA partner school transfer toward your bachelor's degree at Franklin. 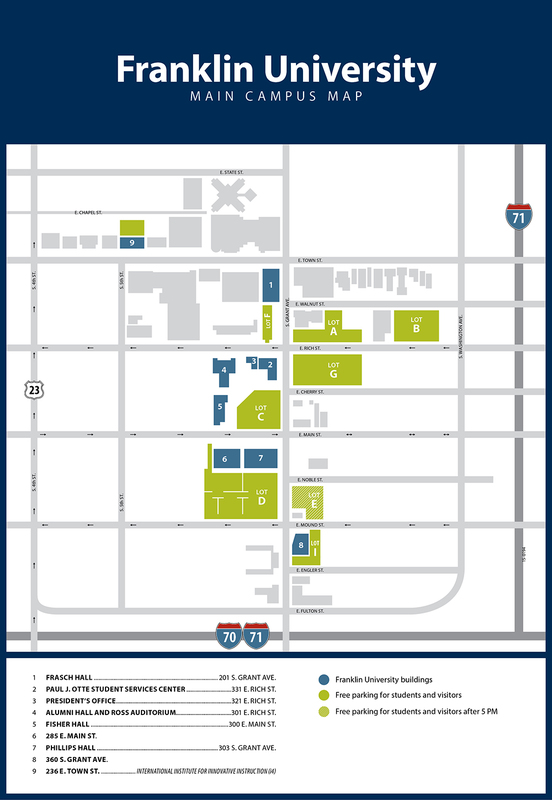 Get a detailed map of Franklin's campus in downtown Columbus, Ohio – including the location of specific buildings and convenient parking options. Some courses in these programs may need to be taken online or at a different location. Contact the location’s enrollment advisor for specific course details. We also offer many general education courses to get you started on any major at Franklin. All programs are available online.